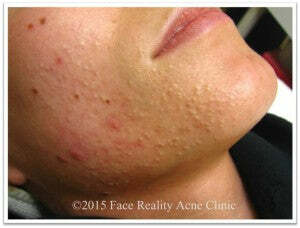 Almost every day we get clients at Face Reality Acne Clinic that think they have blackheads on their nose. I know what they see on their nose looks like blackheads, but it is not. They are called sebaceous filaments. Basically, sebaceous filaments are in the oil glands on your nose and in the chin area just below the lower lip. They are meant to be there and will never go away. Even if extracted, it still looks the same and it fills right back up again a week later. Once in a while, someone actually will have blackheads on their nose. 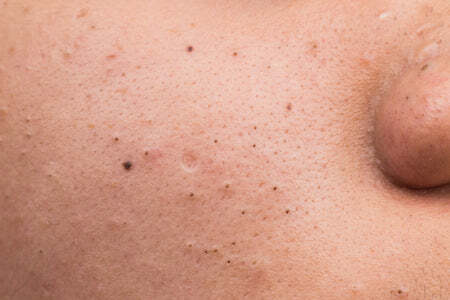 The picture shows someone who has blackheads in between the sebaceous filaments. Those definitely need to be extracted. So, my rule of thumb is, if all the so-called “blackheads” in your nose are all the same size, they are not blackheads. If, however, you have a “blackhead” that is bigger than the rest of the other “blackheads” in the nose, then it really is a blackhead and not just another sebaceous filament. Our clients tend to have a very disappointing reaction to our assessment of the “blackheads” on their nose. They often ask me how to remove the blackheads on the nose. I reassure them that everybody, even people who have never had acne, have them and there is no getting rid of them. Everyone but the most oil-dry of skin does have them. When you are standing a couple of feet away from someone, which is the normal “space” between people, you can’t even see the pores on the nose. We are all so used to looking at air-brushed pictures of models in fashion magazines that have absolutely perfect skin with no pores showing at all. Unfortunately, this sets up an expectation and fantasy that our skin should look just like this. Sorry…… these pictures are just not real; and we tell our clients that they are just going to have to accept their nose the way it is. There just is no “getting rid of blackheads on your nose” unless they truly ARE blackheads.